Anti bad adore and bacteria, no chemical remain, help improve fresh smell, soft textile, care fabric, anti deep stain, suitable for baby cloth, pants, under ware, sock, slim fit cloth,and special costume you need to care. 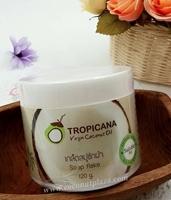 Virgin Coconut Essential Oil 10g. Used for headache, runny nose,insect bites andmuscles aches with massage.